The cervical collars for dogs not serve the same function as the cervical collars for humans. The cervical collars prevent dogs from accessing certain areas of your body that should not reach for some reason. Veterinarians recommend them to prevent dogs can bend his neck to bite an injured area or surgical site. There are many styles of these necklaces available for dog owners. Dogs are quite flexible and can bend their necks to reach any part of your body with their snouts. They tend to chew or lick areas that have undergone recent injuries or surgical procedures. Keeping a dog away from these areas promotes a more effective and faster healing. The cervical collars prevent the dog can bend his neck and reach those sensitive areas. The most common cervical collar is called Elizabethan collar. The name was taken from the high ruffled collars and some were once fashionable and were worn by men and women in the fourteenth century. The collars gave the appearance of range from the carrier neck and created a framework around the back, sides, neck and head, thus achieving a framing effect for the face of those who used it. The cervical collar most commonly used by veterinarians remains the bucket type, known as Elizabethan. This necklace is set in the dog’s neck linking the narrow end thereof with the dog’s collar. This ensures the collar on the dog’s neck. The wider end and open collar extends beyond the dog’s nose, making it look as if his head out the open end of a bucket. The collar restricts the dog’s neck, preventing the snout can reach some areas of the body. The main problem with these necklaces so they can work properly you need to extend beyond the field of view of the dog, so just let you look forward. Not Bite the collars and Pro are new designs. Not Bite is similar to cervical collars human appearance, while the Pro necklace looks like a donut placed in the neck. These rigid collars are made ​​to fit taking as a basis the neck size of your dog. The principle is the same. The collar restricts the neck to bend so you can not reach non-permitted areas. The benefit of these collars is that the field of view is not limited dog because the bucket does not exist effect. The downside is that some dogs find creative ways to achieve the areas that should not be touched. If your vet recommends a cervical collar for your dog, it is likely that he himself provided, many do, but more likely it’s the Elizabethan style. The latest designs are available in pet stores high level or through online dealers. Place the collar on your dog for the first time when you can be with him to watch his reaction. Some tend to panic and especially if it is the original design, bumping into things as they are not used to having such a wide subject in their heads. 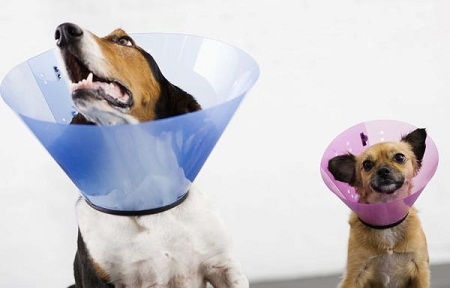 Many dogs adapt quickly if the collar is left in place. Right ways to get back home your dog cozy and warm.